Since its inception, I’ve been stunned at the wrongheadedness and profligacy of the Ann Arbor Percent for Art program (based on a 2007 ordinance). (See our previous posts, For Art’s Sake and Money for Art’s Sake.) Now the subject is back under discussion by the Council (see AnnArbor.com’s coverage of the Council meeting and their earlier article about the issue). Rumor is (via email gossip) that a Council working session may be discussing the program on October 10. It is even more urgent in this time of scarcity to restructure this program, if not to eliminate it. There are three problems with the Percent for Art program. 1. It is almost certainly illegal. 2. It is based on a false premise. 3. It erodes the public trust in government. For this post, we’ll just stay with the first point. Supportive council members sometimes cite the existence of similar-sounding programs in other cities to justify the legality of Ann Arbor’s Percent for Art program. (Carsten Hohnke is thus quoted in the recent AnnArbor.com article.) But those programs are different from Ann Arbor’s in significant ways. An amount not to exceed one percent of the total dollar amount of any construction contract for a building, bridge and its approaches, arch, gate or other structure to be paid for either wholly or in part by the City, shall be devoted to Fine Arts; provided that the Art Commission certifies in writing that said ornamentation is fitting and appropriate to the function and location of the structure. That language clearly indicates that only major construction projects that have a monumental character will have art attached to them. In New York, the program requires “that one percent of the budget for eligible City-funded construction projects be spent on artwork for City facilities”. Note that word “eligible”. Their website continues, “the Program began in 1983 with the development of a procedure for determining eligible projects…(the program) offers City agencies the opportunity to acquire or commission works of art specifically for City-owned buildings”. Again, we are talking about buildings, and not all are eligible. New Orleans stresses that it engages local artists to supply public facilities with artworks. They are paid for with “funding generated by 1% of eligible municipal capital bonds“. Note that word “eligible” again? And if the project is paid for with a bond, it is likely a large project like a building. The State of Wisconsin has had a program since 1980. While “two-tenths of one percent of the total construction budget for selected new state buildings or renovation projects is designated for the commission or purchase of artwork”, it notes that “Only state buildings with a high degree of public access are eligible for Percent for Art funding“. That word “eligible” again! Our Ann Arbor ordinance, in contrast, says that the funding will be one percent of all capital improvement projects. That means just about everything in the Capital Improvement Plan. Capital improvement project means any construction or renovation of any public space or facility including buildings, parks, recreation areas, parking facilities, roads, highways, bridges, paths, sidewalks, streetscape improvements and utilities. Ordinary maintenance and underground stormwater detention are specifically excluded, but otherwise all the construction of any kind done by the city is assessed 1% for the arts program. One percent may not sound like much, but those pennies add up – and subtract. It is not free money. It comes from whatever was funding the particular capital project and that money is then not available to do the work that it was intended to do. And while the other programs mentioned have as their objective ornamenting significant buildings or other important structures, it’s hard to hang a painting on a water main. To be fair, there have been some programs in other states that access a broader range of public projects. See the excellent summary prepared by the Columbus (Ohio) Art Commission. But few of them have tapped restricted funds. According to A2Politico, the use of utility money for a Percent for Art program in Seattle was struck down in court. And none of these programs have had to be legal under Michigan law. Michigan law has its peculiarities, as surely that of any state must. Since we are in Michigan, state law trumps practices in other states. There are two court decisions from Michigan courts that apply directly to the Percent for Art program. The amounts shown in blue are from dedicated millages. 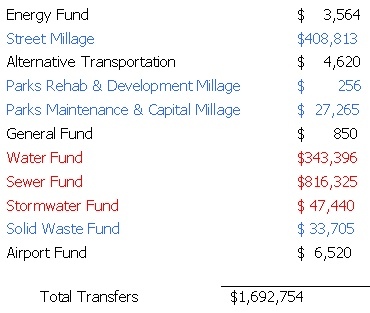 The amounts shown in red are from funds based on user fees. Note that most of the money has not been taken from funds that might be expected to pay for buildings, but rather funds that pay for services. The largest amounts are from road funds and water utilities. But the most important point is that most of the money has been taken from what should be considered restricted funds – that is, funds that are statutorily dedicated to a particular purpose. Such reallocation of dedicated or restricted funds should be illegal. And this is the case, as shown by a couple of well-known Michigan court decisions. Clearly, this has happened in Ann Arbor. When citizens voted for a millage to repair roads, or to maintain our parks, nowhere on the ballot did it say “plus just a little tiny bit for the arts”. 2. Bolt vs. City of Lansing (1997), commonly called simply “the Bolt decision”. Some services are not paid for by millages (based on property tax), but rather by user fees. User fees are not considered to be a tax because they are intended to pay for the service based on its usage, thus are in effect a purchase by the user. Mr. Bolt felt that his fees were being used to pay for services that he was not receiving. The Supreme Court agreed, and further, they said that any user fee that was not assessed for the stipulated service was an unlawful tax. As explained in an analysis from SEMCOG, the court established a three-part test for whether a required payment is a user fee or a tax. • The fee must serve a regulatory purpose rather than a revenue raising purpose. In other words, a fee may not be imposed merely to raise revenue, but must be related to the way the service is administered. • A user fee must be proportionate to the necessary costs of the service. Again, the amount of the fee should be no more than it actually costs to deliver the service. So if your water fees are eating you out of house and home, just conserve water and reduce your payment. The idea is that the fee is related to the amount of the service that you use. The real crowning point of the court’s decision was that any fee that did not meet these criteria was an unlawful tax, not a user fee at all. And because it was a tax, it violated the Headlee Amendment – so it was unconstitutional. So if a municipality levies a “user fee” that is not properly constructed, and is thus actually a tax, it is illegal because it is a tax that has not been approved by the voters for the area where the fee is being levied. Clearly using sewer and water fees to purchase art violates this standard. We cannot deduct the portion of our water bill used to pay for art. We did not vote for this tax. And art is not related to the service for which we are paying the fees. There is no wiggle room here. If the one percent that is being withdrawn for art is not needed, we are being overcharged for the service. If it results in even a minute decrease in needed construction and maintenance for the water utilities, the service is being compromised for a purpose unrelated to the service. These are not abstruse legalities. These are simple, understandable, unambiguous conclusions based on clear court rulings, backed by clear legislative intent. Why has it been so hard for our city attorney’s office to make the same determination? This entry was posted on September 13, 2011 at 12:56 am and is filed under civic finance, politics. You can subscribe via RSS 2.0 feed to this post's comments. You can comment below, or link to this permanent URL from your own site. In the case of dedicated millages approved at ballot, your assertion takes the form of ” nowhere on the ballot did it say ‘plus just a little tiny bit for the arts'”. Keeping in mind that ballot measures are limited to 100 words, if I recall correctly from Ypsi’s transit measure last year, what level of detail is required to meet your standard? If I vote for a millage for “streets”, does that include sidewalks? Curb & gutter? Street trees? Can I challenge a particular road project because the ballot language did not specify “high-type bituminous” as a paving material? Because the width of the right-of-way to be improved was not specified on the ballot? Because when I voted, I wanted the concrete used in the project to be made from recycled fly ash? Because the city switched to an updated set of ADA curb ramp specifications between the ballot and the construction of a particular project, thereby changing the actual project from what I had in mind when I voted on it? To some extent, this is a reductio ad absurdium argument–but there is a perfectly valid point here: when I vote on a ballot item, most of the time I am voting for a program that will, by necessity, have changing specifications and expectations over time. I expect that to go through a public process, to be sure–for example, the order in which streets are rebuilt gets specified as part of the regional TIP programming process, or the municipality might adopt a complete streets policy through the legislative process that updates expectations of a street project–but I don’t expect all of that can be either pre-determined completely at the time of the vote or included on the ballot. Murph, I hope that this is not an indication that you are becoming the Compleat Bureaucrat. Talk about legalistic sophistry! But you raise a useful question and one that is considered carefully every time a ballot measure is devised. The simple answer would be that the money should be used in the way that a reasonable person would consider related to the measure. So street millages could reasonably be used to construct dedicated bike lanes (on the street) in the course of reconstruction, but perhaps not on an unaltered street. If the millage is for street resurfacing (as stated), curbs and gutters might not be appropriate. But an argument might be made in some circumstances that they were necessary to safely resurface a damaged street. Trees don’t relate to street function so would be excluded. I can’t think of any way that art projects could be viewed as a part of street resurfacing. This is a simply fantastic overview of the parameters placed on other Percent for Art programs. What dawned on me when reading the language of Ann Arbor’s ordinance is that the Art Fund has built up $2.2 million rather quickly, and depending on the speed with which the money is spent, it would be possible to build up yet another “slush” fund to be tapped when necessary. That is the M.O. of those on Council at the moment. It’s quite clear that either Council needs to exempt projects funded with millage money AND projects funded with utility money, or the legality of the ordinance should be challenged in court. This, while over $1.2 million taken from these three funds sits idle in the Percent for Art black hole. Yes, which leads to my point about the loss of public confidence in government. One question this opens up: What kind of legal advice is being provided when the city staff or the council write up the language for an ordinance? Seems like a bit of legal research could have surfaced these problems to begin with. As I said, it is a mystery. Glad to see you tackling % for Art. #3 has been my primary concern — in light of the cuts to public safety resulting from the city’s budget situation, even the small amount going to this program just sends the wrong message to taxpayers. It is stunning how tone-deaf the mayor & certain members of council are being about this issue. Yes, I am concerned about that too, and hope to discuss it in a future post.